300 x 216 mm. – 114 leaves, complete. Illuminated initials throughout, 1 half-page miniature and 1 smaller miniature within full borders, 7 historiated initials within full borders. This manuscript is an exiting and imposing book. The calendar and Psalter are two distinct units written by two different scribes after models of different use (Sarum and Roman). The 150 Psalms formed the heart of the daily Divine Office. With antiphons and series of hymns included, this book was made for use by a secular cleric in a parish church or cathedral. The manuscript's patron is depicted at Psalm 109 (f. 83), the first Psalm recited at Vespers on Sunday. Kneeling in prayer and presented by St. Peter, the tonsured figure, probably a wealthy cleric, addresses the Trinity above. The civilians next to King David (Psalm 1, f. 7) seem to confirm the book was made for use in a parish church. 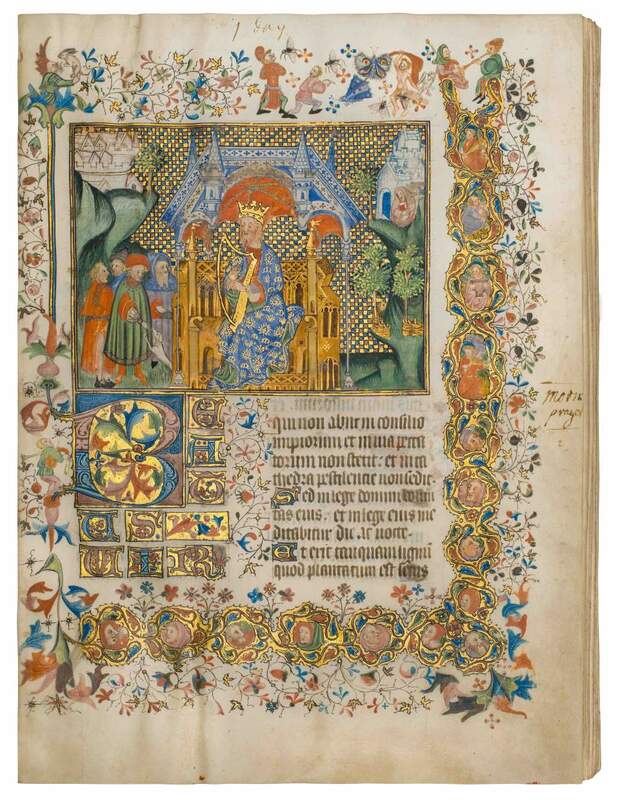 The striking and unusual style of illumination is difficult to localize but refers to the late 14th or early 15th century. The somewhat archaic figures, humorous scenes, and various heads in the borders reveal an artist who applied his own style, which is distinct and singular. It is not often that a new manuscript is found offering such an enigma as to its origin. The lack of comparable material in itself may refer to a workshop away from well-known centres. The patron and the meaning of the golden letters M on David's rich cloak remain unidentified – although it begs the question, could the biblical King David refer to the 'king' of the Welsh Church: St. David of Mynyw or Menavia?